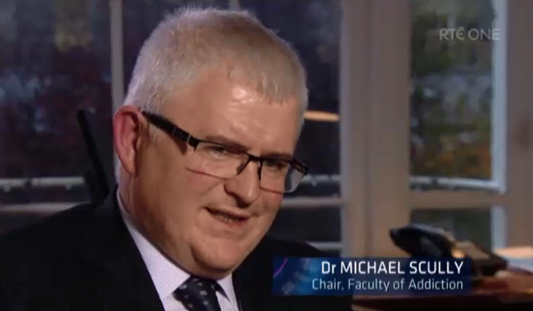 Dr Michael Scully appeared on RTÉ’s Primetime Investigation – The Return of Scientology in Ireland, 19/12/18. Dr Michael Scully spoke to Rita O’Reilly who examined the return of Scientology in Ireland and refuted Scientology’s Narconon rehabilitation programme, considering this treatment for substance abuse and addiction as unsafe and high risk. Scientology’s addiction treatment programme, Narconon, is a detox model which focuses specifically on a ‘non-medical’ approach where a person stops the use of drugs all at once, otherwise known as the ‘cold turkey’ approach, taken alongside a prescribed combination of vitamins with the aim of eliminating all drug residues from the body. This ‘cold turkey approach’ supplemented with ‘mega-doses’ of vitamins has ‘no scientific basis’, and Dr Scully stated that this approach is singularly unsuccessful , carrying a very high risk of somebody accidentally and unintentionally overdosing and dying. Click Here to watch the full episode on the RTÉ Player.